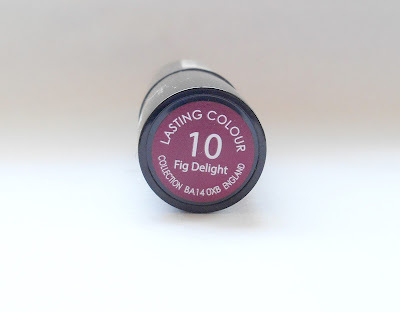 I am reviewing this drugstore lipstick which is from Collection Cosmetics, I purchased this from Superdrug, it is a very affordable lipstick it retails for £2.99 and it has other colours available from red to pink and bright to dark in Collection's lasting colour lipstick range. The colour of the lipstick is very true to its description, it applies as the colour it is shown as. The colour is very beautiful, it is a dark medium brown colour, a perfect colour to wear any day. The lipstick itself has a soft smooth formula and it is very moisturising and creamy love how it feels on the lips, it does not smudge at all and it is very pigmented, it's not a matte lipstick but still I feel it is very long lasting than other lipsticks, if you are going to eat or drink something it will start to come off and will transfer, but it can last on your lips for a couple of hours. After application, the lipstick does not feel drying at all after and I love the finishing result of the lipstick, perfect as a fall lipstick. The packaging is pretty neat as well, it has the colour black and silver, it's not overly designed it's simple packaging and very convenient. It has the name and colour of the lipstick at the moment so you know exactly which colour it is. Also, it has a very sweet scent to it which is not bothering at all. I think for the price it is a very good lipstick. I will definitely be purchasing this lipstick again in the future and in different colours. Overall, I do recommend you purchase this product because it's affordable and also I think it's a great quality lipstick and there are a lot of shades you can choose from. Available at Superdrug and Boots for purchase. Have you tried any of collection's lipsticks?